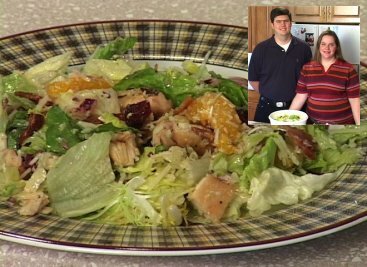 Kathy shows Dan how easy it is to make this tasty Grilled Chicken Salad. Click here (56k) to watch the video. If you have a high speed connection, click here (300k) to see a higher quality video clip. By the way, in the video it looks like Dan is giving you the bird. He's not. He had surgery on his finger recently and he can't bend it yet... Whoops! Clean lettuce mix and iceberg lettuce and pat dry. Tear iceberg into bite-sized pieces. Cook bacon until crisp and crumble. Chop cooked chicken into chunks. In a large bowl, mix European salad mix, iceberg, craisins, bacon, shredded parmesan and sliced almonds. Toss together to mix well. When ready to serve, mix the European salad mix, iceberg, bacon, etc. . . .